Welcome to Louisiana Seafood Exchange! You have just entered the wonderful world of Louisiana Seafood Exchange, Louisiana's only; true premium quality wholesale seafood processor - distributor since 1988. The quintessential specialists in seafood supply for the food service industry and uncontested leader in innovation and marketing. Supplying the finest restaurants, hotels, hospitals, corporate food consortiums, supermarkets, ship chandlers, private clubs, and catering halls. Please take a moment and visit our site. Whether you are searching for superlative seafood products, innovative seafood ideas, or just browsing; if you are interested in seafood we are confident we can help. Our site is full of useful information and suggestions that will help you, the professional chef/restaurateur find the perfect match for your perfect creations. When looking for crabs and crabmeat, crawfish, oysters, shrimp, fish, smoked seafood, specialty items, and any other seafood related delicacy; you need look no further than Louisiana Seafood Exchange. 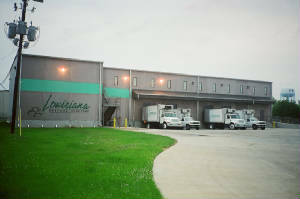 We challenge you to find better quality, better service, and better variety in Louisiana foodservice or retail service. Thanks for stopping by! "With the centuries of combined seafood experience and some of the greatest seafood marketers of all time, this may be the most dynamic lineup of seafood professionals ever assembled in one company."